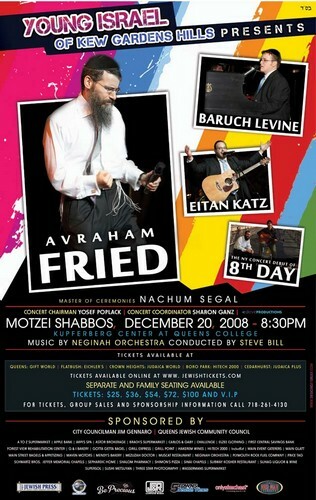 Young Israel of Kew Gardens Hills presents Avraham Fried, Baruch Levine, Eitan Katz and the NY concert debut of 8th Day. Featuring Master of Ceremonies Nachum Segal. Motzei Shabbos December 20th 2008 @ 8:30pm at the Kupferberg Center at Queens College. Music by the Neginah Orchestra conducted by Steve Bill. Concert chairman Yosef Poplack , Concert Coordinater Sharon Ganz, A Dove Productions. Tickets available at; Queens-Gift World, Flatbush-Eichlers, Crown heights-Judacia World, Boro Park- Hi Tech2000, Cedarhurst-Judacia Plus. tickets also available online @ JewishTickets.com. Separate and Family seating available. Ticket prices; $25, $36, $54, $72, $100, & VIP. For tickets, group sales and sponsorship information call 718-261-4130. Jewish Insights winner of 2 tickets is Rochell!